At Hydroblast, we take safety extremely seriously. Predominantly, one of our experienced operators would perform hydrodemolition tasks. However, an increasing number of people are opting to try water jetting for themselves, hiring or purchasing water jetting equipment from us and using it to complete projects of all shapes and sizes. To help ensure your safety, we only hire and sell high and ultra-high pressure water jetting equipment to those who have been fully trained on how to use it properly. To teach people the correct and safe way to handle water jetting equipment, we offer water jetting training courses. 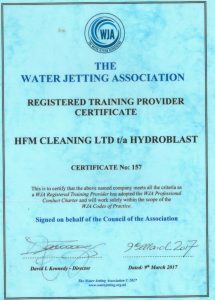 Hydroblast are also a WJA Registered Training Providers, demonstrating our commitment and high standards in regards to our water jetting training services. What High-Pressure Water Jetting Courses do Hydroblast Offer? A two day course for drain and sewer cleaning using high-pressure water. A mandatory safety awareness training course. What Happens During Water Jetting Training? 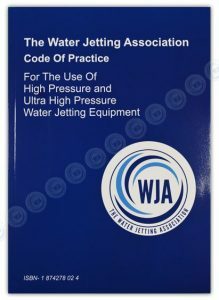 Over the course of two days, participants undergo a combination of hands-on and lecture room training based on The Water Jetting Association’s blue Code of Practice. During this course, trainees are taught how to use high-pressure water jetting equipment safely, including how to safely enter confined spaces. Individuals who have little to no experience handling water jetting equipment. Experienced operators who have not attended training previously or require re-training due to changes in equipment specification or legislation. After successful completion of this course, the trainee is awarded a certificate of training achievement, accredited by City & Guilds. This one day course covers the main principles of safety when handling high and ultra-high pressure water jetting equipment. Upon completion of this course, trainees become eligible for a certificate and photo ID card. Why is it Important to Take Part in a Water Jetting Training Course? When used incorrectly, water jetting equipment can be extremely dangerous. One aspect of hydrodemolition which requires particular attention is the reaction forces. A reaction force in hydrodemolition is the counter-force exerted onto the operator when using a high-pressure water jet to perform tasks. If the water jetting reaction force is calculated inaccurately, the risk of worker fatigue, injury and accident increases. When you take part in a water jetting training course, important safety considerations and detailed explanations on how to use the equipment are taught, strengthening your knowledge and ensuring your welfare. If you buy any new 1000 bar or higher machine during March, April or May this year, you can book yourself and five other members of your team into one of our water jetting training courses for free! Contact us today for more information.